I remember as a kid we would put sweaters on our dog because she would get chilled whenever it was cold outside. Back then, I don’t remember seeing any dog costumes available for her. If we had come across one, I’m sure my younger sister and I would have begged my Mom to let us get it and dress her up in it. 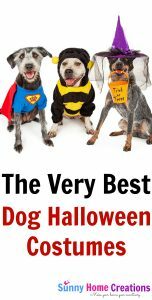 Here are some super fun dog Halloween costume. I hope you find the perfect costume for your companion. Did you love the movie about Wonder woman? Dress your dog up as Wonder Woman for Halloween! You can find a wonder woman dog costume here. Do you or your kids love playing Pokemon or Pokemon Go? Maybe you’d love for your dog to be Pikachu from Pokemon? You can find the Pikachu Dog Costume here. Maybe you want to have your dog dress up as a weiner dog? You can find a weiner dog costume here. Are you a Star Wars fan? How about dressing your pooch up as an Ewok? My nephew would have loved this for his dog when he was little. You can find an Ewok Dog Costume here. If you want a dog star wars costume, there are other options than an Ewok. There is Darth Vader, Princess Leia and even Chewbacca! If your dog isn’t good with wearing a costume, there is a Yoda headpiece as well. So many dog star wars costume options! How cute is this lion costume for dogs? It even has lion ears on it! It isn’t a full costume since it’s just the lion mane, which would work better for some dogs. You can find the lion costume for dogs here. You can find a Dorothy from the Wizard of Oz Dog Costume here. If you love all the Pirates of the Carribean movies, dress your dog up as a pirate! You can find a Pirates of the Carribean Dog Costume here. If you have a couple dogs and one is dressed up as Wonder Woman, you can have your other dog match by being dressed up as Superman. You can find a Superman costume here. How fun are these? Like, I wish I had a million dogs to dress up. Well, ok, not really. I am happy just having my one puppy, but he might just get dressed up this Halloween! Previous Post: « Non-candy Halloween Treats That Are Awesome!